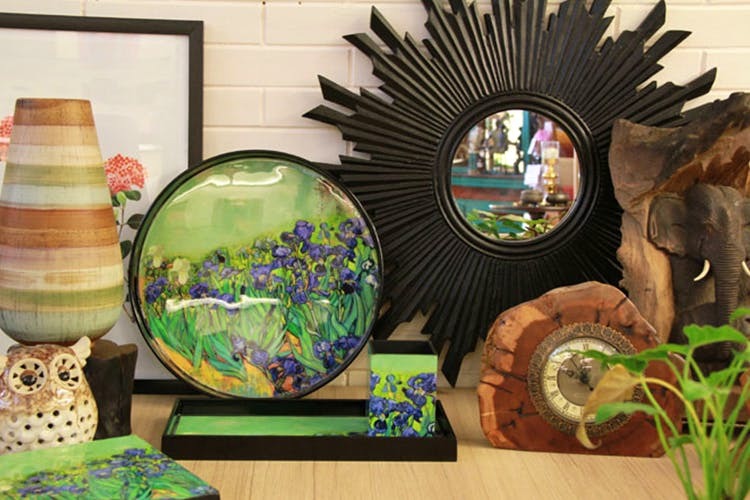 Mora Taara on Peddar Road is a quirky store that will sort out your home decor and gifting woes. Their products are uniquely designed to incorporate Indian aesthetics with Western influences. Mora Taara is founded by Anuradha Kumar, a former journalist who found her calling to establish this store which translates to ‘My Star’ in colloquial Hindi. The idea behind Mora Taara was to offer the urban dwellers of the sky scrapers a charming way to style up their houses with traditional yet quirky decor items. The shop itself is like a beautifully done apartment and we felt the urge to pick up everything. The walls are beautified in hues of browns, and we found a lot of vintage decor items hung on the wall (apart from everything that was on sale). Mora Taara also has a website which offers home-delivery. For the lazy ones, their gifting section is pretty resourceful, find gifts suitable for all sorts of occasion from housewarming to birthday to even a wedding; a win-win kind of a situation. They have a wide range of artefacts that have been handcrafted to perfection. A vintage metal key holder (INR 1,090) is bound to make your guests go 'WOW!' the moment they enter. They have quirky garden accessories starting at INR 390, metal clocks for INR 4,800, barware starting at INR 750, and a host of other things that will make you turn into a compulsive shopper almost instantly. Give your home a makeover or add splashes of cutesy home decor items and stop by Mora Taara for a quick bout of shopping. Allow this to be a gift to yourself this festive season, or score some for that wedding you're going to.